I tried to set Adapter options to various things in OS/2 but cant go behind this error. 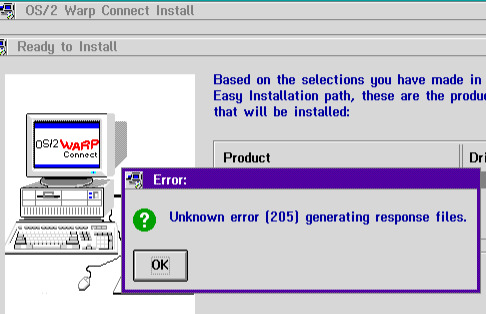 Anyone ever solved this issue and installed the whole OS/2 Warp 3 Connect package with Network functioning? as explained here http://www.os2museum.com/wp/installing- ... l-machine/ the issue came from that I did not install correctly the CDROM for OS/2 and it caused OS/2Warp 3 Connect installation the unknown error. What build of 86box were you using? PCem v13 and v13.1 also has support for NE2000 too. Yes, but 86box' code is more modern for the networking part, both ne2000 and the general network handler. I got Warp 3 Connect running in VirtualBox with the PCNET II driver, it seems to work just fine. I have not tried any display drivers outside of the 640x480x16 default driver. I found the drivers at http://www.os2warp.be/index2.php?name=nicpak.